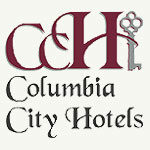 The Columbia City Hotel and its sister, the Fallon Hotel, are authentically restored 19th-century country inns. All rooms are elegantly appointed with Victorian antiques, custom crafted wall coverings, and beautiful lithographs. Each hotel has a sitting parlour where you can peruse books and magazines, or participate in one of many board games. While both hotels stay as faithful to 19th century decor as possible, modern conveniences such as indoor plumbing, heating. and air conditioning have been added. Each room has a half bath and a shower basket is provided for the trip down the hall to the shared shower rooms. There are also three charming cottages- a one-bedroom, two-bedroom and three-bedroom-each with a full kitchen, fenced yard and DVD player. Take a step back into history and make Columbia your next vacation destination.